Family-friendly condo with shared seasonal pool & hot tub - walk to village! 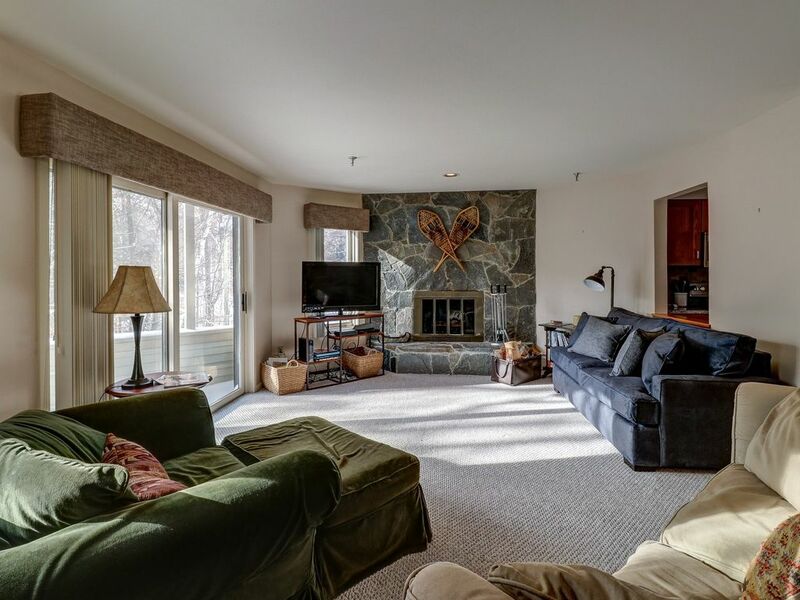 Head to Stratton for your upcoming mountain getaway and enjoy a shared pool and hot tub (during summer months), as well as easy mountain access, when you stay in this two-bedroom, family-friendly condo. Walk to the village or catch the nearby shuttle to the mountain, and revel in the simplicity of mountain life. Spend your days careening down the slopes or head to the backcountry for some cross-country skiing or snowshoeing. Snowmobiling tours and an adventure with the Green Mountain Mushers are also available at Stratton Mountain. Gather up your family and friends and head to the Coca-Cola Tube Park or rent some "Fat Bikes" to ride on the Nordic Center Trails. If you visit in the summer, do some hiking and exploring, or spend the day relaxing at the Day Spa at Stratton Village. The condo is beautifully appointed, featuring a cozy living area with an eye-catching wood-burning fireplace, large flatscreen TV, and sliding glass doors that lead to the balcony. The separation between the bedrooms and bathrooms provide plenty of privacy and make morning and bedtime rituals easy. Other added conveniences include free WiFi access so you can stay in touch with friends and enjoy online entertainment and a private washer/dryer so you can pack light and stay fresh throughout your stay. There's also an on-site fitness room so you can stay true to your workout regimen. Make your Stratton vacation fun and stress-free. Book this condo today! Parking Notes: Parking for four cars is available in front of the condo. close to the mountain, clean and purposeful. Great for a ski holiday. Kitchen was clean and modern. Great layout. Wood burning fireplace. Walking distance to village. Bedding and towels could’ve been more upscale. Overall we were happy with the place. It was everything that was promised. Nice layout with plenty of room to spread out. Would i come back to stay here, yes. Condo was uncomfortable upon arrival at 78 degrees since the unit was not air conditioned. Ceiling fans would have been nice.